Anthony Jerome "Spud" Webb (born July 13, 1963) is a retired American NBA professional basketball point guard. Webb is notable for winning a slam dunk contest despite being one of the shortest players in NBA history. NBA.com lists him at 5 feet 7 inches (170 cm) tall. He is currently the President of Basketball Operations for the Texas Legends, the D-League team for the Dallas Mavericks in Frisco, Texas. 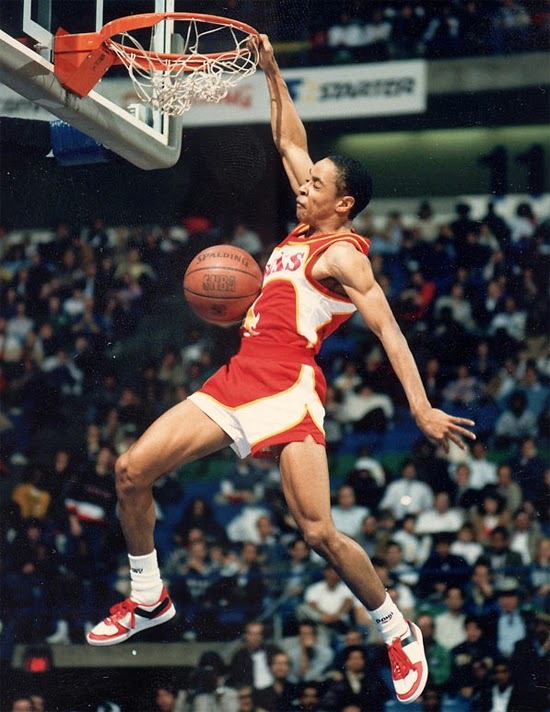 Webb was the shortest person to compete in the NBA Slam Dunk Contest, winning the event in 1986. His participation surprised the media; including his teammate and defending dunk champion Dominique Wilkins, who had "never seen me dunk before," Webb said. His dunks included the elevator two-handed double pump dunk, the off-the-backboard one-handed jam, a 360-degree helicopter one-handed dunk, a reverse double-pump slam, and finally, the reverse two-handed strawberry jam from a lob bounce off the floor. He defeated Wilkins with two perfect 50-point scores in the final round. Atlanta coach Mike Fratello said, "Spud kind of duped him. He told Wilkins he never had anything prepared, didn't practice for it. So, Wilkins maybe thought his normal assortment would be good enough to get through". Twenty years after Webb's victory in the Slam Dunk contest, he trained New York Knicks point guard Nate Robinson (who stands at 5 feet 9 inches tall) to win the event. Webb tossed the ball to Robinson, who leaped over Webb and dunked, earning 50 points from the judges. Robinson went on to win, making him and Spud the only two people in NBA history under six feet tall to win a slam dunk contest.